10PK Blk/Wht/Blush High Leg Midi Briefs is rated 2.7 out of 5 by 6. 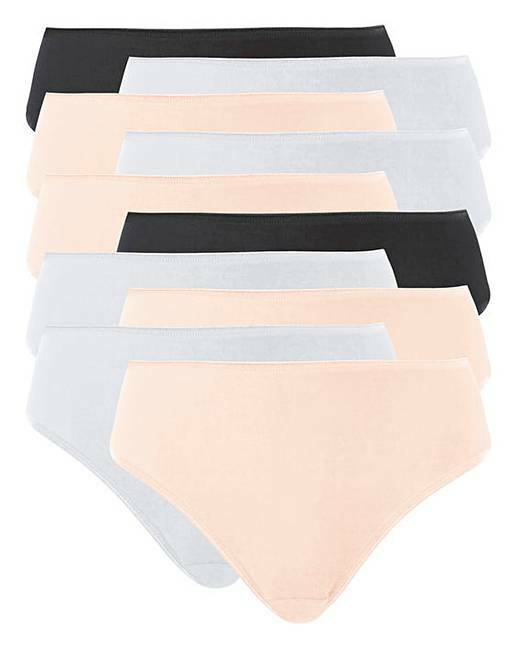 The pack includes 4 blush, 4 white and 2 black coloured briefs. Presented in a high value pack of 10, these high-leg briefs are a must-have addition to your lingerie collection. Perfect for everyday wear, these high-leg briefs feature a high leg cut creating the illusion of a longer leg and offers good bottom coverage. Made from 100% cotton, these briefs are incredibly comfortable and feel so soft against the skin, and the pretty, picot edge adds a delicate finishing touch. Pack includes 2 black, 4 white and 4 blush briefs. Rated 2 out of 5 by Brandon fan from Comfortable but poor quality. These knickers were comfortable and nice fitting, but, once washed the quality was very poor. One pair were ripped when they were took out the packet. Unfortunately I couldn’t return them, as some were already worn. My advice, don’t have these! Rated 1 out of 5 by Poppy from Poor cut Front leg cut too high, leaving me feeling a bit exposed. If pulled down to a more comfortable level, the crotch is too long. Material soft, but a bit thin and flimsy.Have returned items.